"This recipe is quick to make, with dazzling colors and a light oil-free dressing. If you use sushi vinegar, you won't need any additional salt or sugar." Peel cucumbers into a striped pattern lengthwise using a vegetable peeler. Slice cucumbers in half lengthwise; cut each half into 1/4-inch slices creating 'half-moon' shapes. 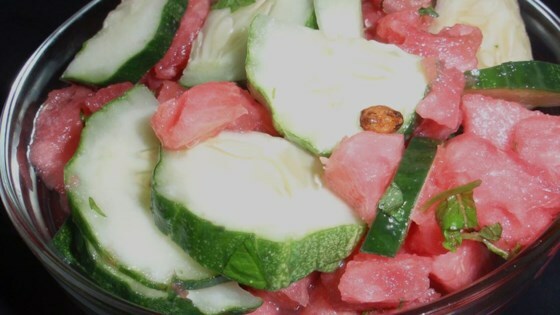 Combine cucumbers, watermelon, and red onion in a large bowl. Whisk rice vinegar, white wine vinegar, and lime juice together in a bowl; add mint. Muddle the mint by vigorously stirring and pressing the leaves with a spoon until they look bruised but aren't falling apart. Remove and discard mint leaves. Drizzle the dressing over salad and gently toss. Sprinkle feta cheese over salad; toss gently. I also omitted the feta cheese, and added cilantro and honey. Nice and refreshing summer salad.